Cassava Brown Streak Disease (CBSD) is threatening gains made in the intensification of cassava production in Africa. Since my colleague, Abigail Rumsey, reported on the resurgence of this disease in East Africa, and spread to Central and Western Africa, there are now reports of it spreading to northern Africa, thereby threatening food security of more than 100 million people. Cassava is one of the most important staple crops grown in tropical Africa. Its extraordinary ability to survive high temperatures and tolerate poor soils has led to it being called the “Rambo root”. It is an important source of calories in the tropics, coming third only to rice and maize, respectively. Additionally, cassava is the cheapest known source of starch grown by poor farmers – many of whom are women – often on marginal land. The threat posed by CBSD is particularly alarming considering its symptoms are not easily recognizable to an untrained or inexperienced person, and worse still, its symptoms are often mistaken for the more familiar Cassava Mosaic Disease (CMD). In addition, rising temperatures and changes in the genetic makeup of whiteflies threatens to gun down the “Rambo root”. CBSD manifests itself on leaves as patches of yellow areas (chlorosis), on the stems as dark-brown streaks and spots, and dark brown hard rots can be seen on the roots when cut. In severe attack, there are radial constrictions and/or pits on the root surface. There is no specific international research organization for cassava, unlike wheat, rice, potato and maize, and no private-sector interest. 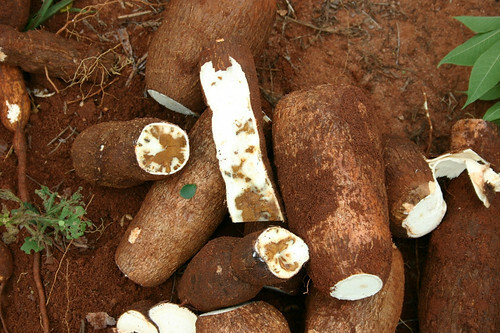 Recently, initiatives and projects on cassava diseases have been spearheaded by national research organizations, such as the International Institute for Tropical Agriculture (IITA) and some international NGOs. However, focus has been on the Cassava Mosaic Disease, at the expense of CBSD. However, there seems to be a change of heart (and rightly so) with players such as Cassava Regional Centre of Excellence (CRCoE) working towards solutions for this devastating disease. The CRCoE, established under the East Africa Agricultural Productivity Program (EAAPP) was funded by the World Bank. Some of the recommended management practices include the use of improved disease-free planting material, scouting and uprooting diseased plants, crop rotation and keeping weed-free fields to reduce whitefly infestation. While there seems to be some semblance of activity towards addressing the challenge posed by CBSD, a lot of research and awareness campaigns still need to be done considering the aforementioned threats and the crucial role cassava plays in food security.